1.9 Representation of hyperbolic twocomplex numbers by irreducible matrices. 3 Commutative Complex Numbers in Four Dimensions. Two distinct systems of hypercomplex numbers in n dimensions are introduced in this book, for which the multiplication is associative and commutative, and which are rich enough in properties such that exponential and trigonometric forms exist and the concepts of analytic n-complex function, contour integration and residue can be defined. The first type of hypercomplex numbers, called polar hypercomplex numbers, is characterized by the presence in an even number of dimensions greater or equal to 4 of two polar axes, and by the presence in an odd number of dimensions of one polar axis. The other type of hypercomplex numbers exists as a distinct entity only when the number of dimensions n of the space is even, and since the position of a point is specified with the aid of n/2-1 planar angles, these numbers have been called planar hypercomplex numbers. The development of the concept of analytic functions of hypercomplex variables was rendered possible by the existence of an exponential form of the n-complex numbers. Azimuthal angles, which are cyclic variables, appear in these forms at the exponent, and lead to the concept of n-dimensional hypercomplex residue. Expressions are given for the elementary functions of n-complex variable. In particular, the exponential function of an n-complex number is expanded in terms of functions called in this book n-dimensional cosexponential functions of the polar and respectively planar type, which are generalizations to n dimensions of the sine, cosine and exponential functions. In the case of polar complex numbers, a polynomial can be written as a product of linear or quadratic factors, although it is interesting that several factorizations are in general possible. In the case of planar hypercomplex numbers, a polynomial can always be written as a product of linear factors, although, again, several factorizations are in general possible. 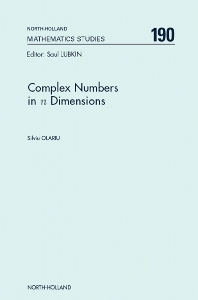 The book presents a detailed analysis of the hypercomplex numbers in 2, 3 and 4 dimensions, then presents the properties of hypercomplex numbers in 5 and 6 dimensions, and it continues with a detailed analysis of polar and planar hypercomplex numbers in n dimensions. The essence of this book is the interplay between the algebraic, the geometric and the analytic facets of the relations. University libraries. Libraries of research institutes for mathematics and physics. Departments of mathematics and physics of universities. Departments of mathematics and theoretical physics of research institutes.